Over here in “music land,” there are lots of moving parts this year. First, there is the chorus — made up of adults and teens, and numbering about 55. We have been learning music in Spanish, Catalan, Judeo-Spanish (otherwise, known as Ladino), and Arabic. We have been rehearsing since the beginning of September, but things are really picking up now! This year, we have two groups of specialist musicians (in addition to the fabulous Washington Revels brass), and we have already gotten to work with both of them. Last weekend, Layali El Andalus came down from New York City to teach us their music, and then they performed in a salon-concert that evening. 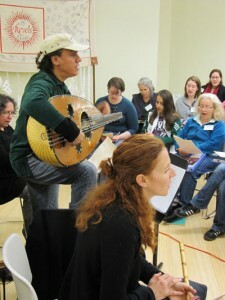 You can learn more about them at http://revelsdc.org/revels2011/layalielandalus.html. They are fantastic musicians and really great teachers. We had lots of fun learning their music. Last night, we had a visit from Trio Sefardi (Howard Bass, Tina Chancey and Susan Gaeta). They specialize in Sephardic music (music of the Spanish Jews). Howard plays lute and guitar, Susan sings and plays guitar, and Tina… well, she plays just about everything (there will be more about her later). Learn more about these great musicians here: http://revelsdc.org/revels2011/triosefardi.html. They will be presenting a salon-concert with Sephardic singer, Flory Jagoda, on November 17. Meanwhile, we have an amazing group of children, busily learning their music — and guess what, they sing in Spanish, Catalan, Ladino, and Arabic too! And we have lots of guitars (who happen to be members of our chorus), and some fiddlers, and a recorder player… so, stay tuned for lots more about this year’s music.